David Beckham is at a centre of a Whitehall campaign to prevent him being made a knight. This has come about due to his blasted move to the states. There are concerns about his move to play in the United States, where he will effectively be a tax exile, and also questions about whether his wife should become Lady Beckham. Sir David and Lady Victoria Beckham. I love it. I hope those stuffy bods in Whitehall give Sir David his title. He has worked hard enough to deserve it. My girl Lainey is a Posh and Becks obsessive like me. She posted the clip and questioned their body language. I have always talked about her interest in football or lack of interest in football and he loves football so you can understand why they are distant in this clip. He is agonising over the game and she is agonising over her top, make-up, hair, manicure...basically everything but the game. I think she is just letting him get on with it rather than drape herself all over him when he clearly has other things on his mind. This makes her a good wife...no? The beginning of the end? I don't think so. 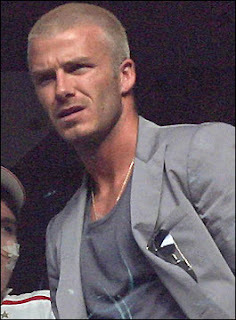 The Daily Mail and other sources are asking with David being handed a dramatic England recall by Manager Steve McClaren, is Becks getting cold feet - and wishing he was staying in Spain to further his football career? There was a private celebration of David and his Real Madrid team mates last week in which David Beckham was presented with a cake with the words "You'll Never Walk Alone" iced on it in chocolate, and an inscribed silver tray which urged him to remember the good times he has had at Real Madrid. Beckham is said to have had tears in his eyes when he stood up to receive the keepsake. He told his close friends and team-mates Roberto Carlos, Cicinho and Michel Salgado, who had arranged the party for him: "I will never forget you. You are like my family." He added: "I will return to Madrid whenever I can." He was reportedly genuinely moved by this expression of esteem from his peers, and filled with regret at the thought of leaving them. How, then, must he feel now that his move to Los Angeles is looming? I have been reporting for a while that my initial excitement of the move has now turned to disappointment, as he is still at the peak of his career. He now is taking a leap into professional oblivion - and more than one ally of David claims that he is having serious second thoughts. "He's starting to get cold feet," said a friend of his sister Joanne this week. "He would much rather than anything else be with his family in Hertfordshire. He's a home-loving boy." David, have a look at your contract again. There must be a get out clause. Victoria Beckham left Heathrow Airport yesterday with a yellow ribbon around her Hermes bag. Is this a new trend you ask? No it is a show of support for a little girl called Madeleine McCann, a four year old British girl who went missing from a holiday apartment in Portugal. It has been widely reported that Victoria was going to Madrid via Heathrow to meet David, but regular readers will know that David is in the UK training with the England team for their match against Brazil on Friday. It seems Victoria Beckham likes a good British pub as much as the next person. She stunned regulars yesterday at the Freemasons pub in Hampstead, North London, by popping in for a glass of wine. Posh, drank Spanish Riscal at £3.50 a glass with her sister Louise and two blokes, and told how proud she is hubby David is back in the England squad for the Brazil match on Friday. 'I am so excited he's back — it's great for the whole family. David is delighted and so are we all,' she told The Sun. But the ex-Spice Girl, dressed all in black, had to speak in torchlight after a power cut plunged the pub into darkness. Here is David back were he belongs training with his England team mates. He must also be smiling due to the fact that FIFA have warned Los Angeles Galaxy they will not be able to prevent David Beckham playing in England friendlies. Galaxy general manager Alexi Lalas only wants to release the midfielder for competitive internationals, but FIFA insist the club will have no choice if Beckham continues to be picked by England manager Steve McClaren. Woohoooooo.....just gets better and better. The only thing that will top off this great news is if David announces that he is no longer going to America. Following confirmation of his recall at the weekend, Beckham travelled back to England from Spain and was last off the coach when the squad arrived at Arsenal's training facilities. After training Beckham signed autographs and posed for pictures with fans before boarding the team bus. I am so jealous. If I had a car I would travel to see him train. Australian Clairvoyant Jeanette Kumara has written a book concerning the past lives of the stars. 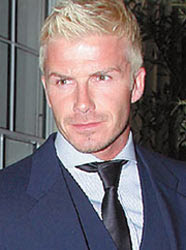 Below is what she believes are Victoria and David Beckham's past lives. Some time in the 1600s, they shared a life in Italy David was intellectually handicapped, and Victoria was his older sister, who had to care for him after their parents died. As David grew older, Victoria yeanred for a life of her own. He made this impossible because he needed constant care and acted like a spoilt child if he didn't get his own way. Eventually, Victoria decided David should be sent to an asylum. He protested and became violent, but Posh stood her ground and David was taken by force. Victoria then married and had the children she wanted so dearly. This time around, Victoria should take care because David is still seeking revenge. ???? Seems crazy but I thought I would share. Real Madrid maintained their grip on the Liga title race with a 3-1 win over Deportivo La Coruna tonight. Valencia had been beaten earlier in the day which knocked them out of the title race leaving it a three horse race should Sevilla beat Real Zaragoza tomorrow. Sergio Ramos gave Real the lead after 29 mins. Captain Raul scored the second after 58 mins and Ruud van Nistelrooy scored the third to ensure they will head the table with two games remaining. Beckham came close to capping his return to the England squad, but an excellent free-kick from 20 yards crashed against the inside of the post. Real can not afford to lose any points and should win both these games and take 3 points from each game as Barcelona won on Saturday also to stay close in second. Has Victoria Beckham Given In To Scientology?